Also known as Caoimhghin, Coemgen, Coemgenus, Comegen, Keivin, Kevin of Glen da Locha and Kevin of Glendalough. 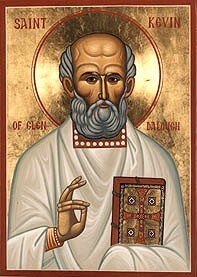 Abbot of Glendalough, Ireland, b. about 498, the date being very obscure; d. 3 June, 618; son of Coemlog and Coemell. His name signifies fair-begotten. 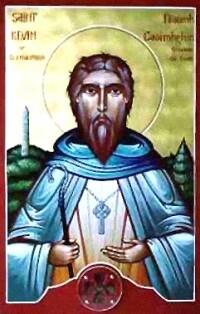 He was baptized by St. Cronan and educated by St. Petroc, a Briton. From his 12th year he studied under monks, and eventually embraced the monastic state. Subsequently he founded the famous monastery of Glendalough (the Valley of the Two Lakes), the parent of several other monastic foundations. After visiting Sts. Columba, Comgall, and Cannich at Usneach (Usny Hill) in Westmeath, he proceeded to Clonmacnoise, where St. Cieran had died three days before, in 544. Having firmly established his community, he retired into solitude for four years, and only returned to Glendalough at the earnest entreaty of his monks. He belonged to the second order of Irish saints and probably was never a bishop. So numerous were his followers that Glendalough became a veritable city in the desert. His festival is kept throughout Ireland. Glendalough became an episcopal see, but is now incorporated with Dublin. St. Kevin's house and St. Kevin's bed of rock are still to be seen: and the Seven Churches of Glendalough have for centuries been visited by pilgrims.